Pete’s Tire Barns was started by Peter A. Gerry, then only 18 years old, in 1968 at a small garage in Athol, Massachusetts. Originally selling automobiles (as Pete’s Auto Sales) and performance tires, the company expanded its operation to include a full line of passenger tires, new and retreaded truck tires, farm/agricultural tires, off-the-road tires, and several other product lines. Today, approximately 90% of our business is in the commercial truck tire and related markets. Our company’s goal is to provide the best overall tire products and services for the New England market. By aggressively pursuing expansion opportunities, Pete’s has been able to help build its network strength through acquisitions and new store development. This growth has allowed the company to provide customers with top-notch sales and service regardless of where they operate in New England. Through these efforts, Pete’s Tire Barns has grown to one of the largest independent commercial tire dealerships in the country. 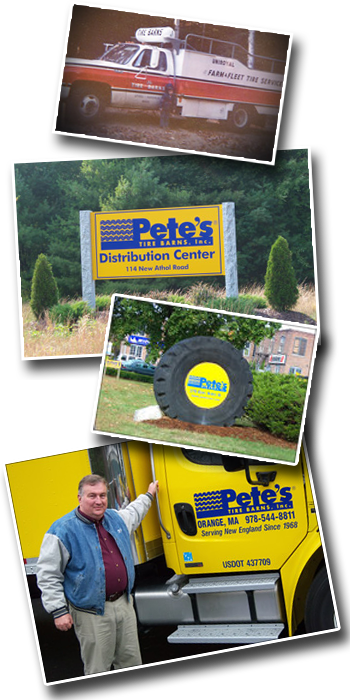 Pete’s currently operates 19 full-service locations in New England, a brand new state-of-the art Distribution Center, 2 Bandag retread facility, employs in excess of 200 people, and operates a fleet of over 100 service and delivery vehicles. Pete’s Tire Barns is also a member of the American Commercial Tire Network (ACTN®), which is a group of leading independent commercial tire dealers that have joined together to create a nationwide emergency road service network that provides unparalleled, dependable emergency road service at predictable prices for commercial vehicles. Formed in 1999, the alliance has grown to include 17 member companies that operate 1700 service vehicles in 43 states. Our members own more than 75 retread plants and 340 service locations with 4700 employees nationwide. Through the ACTN® reciprocal program, customers are assured of quality service 24 hours a day, 7 days a week. Additionally, ACTN® is committed to promoting safety within the commercial tire industry and has collaborated on the production of training videos that provide instruction for emergency road service personnel. In 2018, we celebrated our 50th year in business and we are growing stronger each year. To listen to our Customers and develop innovative programs to serve their needs. Deliver exciting quality – cheerfully and on time. Bring to central New England the best equipped and best staffed fleet and emergency service with central station dispatch for after-hours emergencies. Maintain a technologically advanced retread plant second to none. Head our industry by developing outstanding training and safety programs and an environment which will bring out the BEST in our TEAM!